My great-aunt Tarla Dalal was an incredibly famous Indian cookbook author. A vegetarian herself, she only wrote vegetarian recipes that were then translated into many Indian and International languages, including Russian and Dutch. She was truly a pioneer - her first cookbook was published in 1974, well before the Internet and social media, and she published over 100 cookbooks in her time. I always loved visiting her house — as you might imagine, the food was always incredible. You can find all her recipes online at TarlaDalal.com if you’re interested in truly authentic Indian vegetarian recipes. I visit her website often, but I’ve found it has a few limitations. For one, it lacks the high impact visuals that I’m used to from sites like Domesticate Me, Smitten Kitchen and New York Times Cooking. Second, the recipes are only vegetarian, and sometimes they’re hard to follow, and I’m Indian, so theoretically, these are familiar to me!!! 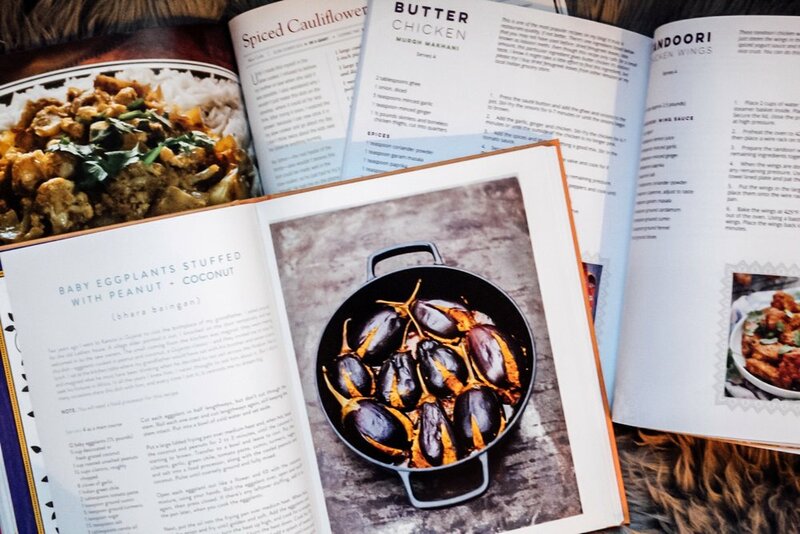 A few years ago, I found myself in pursuit of the best Indian cookbooks. My primary criteria was that the recipes tasted like home. Next, I wanted clear directions, and pretty pictures didn’t hurt either. And while there were some truly mediocre ones, I’ve found a few that are worth the purchase if you truly love Indian food. Made In India and Fresh India, both by Meera Sodha: I first learned about Meera Sodha from a recipe she contributed to the NYT Cooking site - she’s based in England, but her family is originally from the same part of India that my family is ancestrally from. Her recipes taste very much like the recipes I grew up on, as well as some recipes that I’ve never tried before. They’re all easy and pretty quick to execute, and she taught me some really great tips like making sure that you fry dry spices in oil for maximum fragrance and flavor. Her recipes require no special gadgets - just your basic pots and pans. I’ve tried multiple recipes from both books, and have never gone wrong with an of them. Indian Food Under Pressure by My Heart Beets (Ashley): Ashley is a blogger, so I suppose you could technically find these recipes online, but I personally prefer using a paper cookbook for recipes. There’s something to be said for the screen not going dark or locking due to auto sleep settings. Anyway, Ashley’s recipes are all gluten free and also Instant Pot (or other electric pressure cooker) friendly. Because you’re putting ingredients in an instant pot, they are not aesthetically the same as assembling a regular recipe. But if you want really good Indian food with minimal fuss, and want to use your instant pot more, this book is a really good one to use. I got this one fairly recently so I haven’t cooked quite as many as from Meera Sodha’s books but everything I’ve tried has been really good (except for one which was user error - turns out I don’t really love coconut milk unless it’s in a curry). The Indian Slow Cooker by Anupy Singla: This book has the best Indian slow cooker recipes I’ve tasted. That said, you do need a slow cooker that has a digital timer and warming function because you can’t leave Indian food to cook on low forever — the spices start to taste funky. I’ve used this cookbook to cook for a party for 40 people. While I will never cook for 40 again, rest assured I still use these recipes for those days that I’m feeling really lazy and want to dump a bunch of stuff into a slow cooker. Are you a fan of Indian food? Leave me the favorite Indian food you’ve tasted in the comments! Disclosure: This post contains affiliate links which means I earn a small commission if you make a purchase using any of the links in this blog post (at no cost to you). As always, all opinions are 100% my own, and I only recommend products that I’ve tested myself and love! If you like this post, you may also like our post on Tea Infused Cocktails for Fall, which includes a recipe for Bombay Government Punch.